You cannot lose if you do not play…. In previous blogs, one could find a number of stories about beer wholesalers who have violated federal and state beer laws and regulations. Even some who violated standards by going outside the parameters of their franchise agreements with suppliers. These narratives ended with the wholesaler being penalized in some form or other, and, in every case, the end result was that the wholesaler lost their company. It did not matter if the wholesaler was larger or small. Whether it was the Schlitz wholesaler in Pennsylvania who refilled Schlitz kegs with Old Milwaukee beer and then resold them as Schlitz, or the multiple Coors wholesalers who transshipped beer back east or even out of the country during the 70s and 80 and were caught doing so, all who violated the laws paid a price. Even the sad situation of Murray Brothers in Denver has a similar ending. Cases of Pabst were sold as 3.2 beer, when in fact, the Pabst was actually strong beer and the owner had instructed the warehouse to erase the strong beer markings and had it resold as 3.2. The state discovered what Murray Brothers had done and suspended their licenses, resulting in a number of vendors terminating their agreement the wholesaler. What was left of the wholesaler was sold to a competitor. Just this past week, the industry has learned that the Sheehan’s company, Craft Brewers Guild of Massachusetts, has been found guilty of paying retail outlets to ensure their brands were on tap. According to the state, CBG was paying between one and two thousand dollars per handle. At this time the penalty for Craft Brewers is to suspend their state licenses for 90 days. If this suspension does come to fruition, what would it mean to the vendors represented by CBG? The vendors could transfer their business to other wholesalers without paying for their brands due to contractual violations by CBG. What if the vendor, however, is doing business with the Sheehan’s in other states? How would that play out for both companies? In one word: awkward! The state of Massachusetts is constantly investigating retailers who are involved in this illegal activity. The outcome in many scenarios could become very messy. What has not been determined is the role of the vendors involved. Should the industry assume that the vendors, whose beer was on tap, did not directly or even indirectly know anything about possible illegal activity? Buying accounts, or the pay-to-play game in the industry has been going on for years, but recently, with the rise of the craft beers, and the pressure to get volume and customers, an environment has been created at the retail level which makes this pay-to-play game more common. The vendor’s named, or those involved, need to be held accountable, too. Maybe they will. The craft beer industry has, and will, continue to change the laws to fit their business needs and models. Many of these changes are welcomed and long overdue. It is safe to say that a number of other regulations also need to be modified or eliminated to meet today’s industry needs in providing access to the market at all levels. But buying the business at retail will only damage the beer industry. What is happening in Massachusetts with the Craft Brewers Guild is just the beginning. You cannot lose if you do not play…..
For decades, every major brewer held an annual convention for their wholesalers. Conventions were held for ABI, SABMiller, and Crown, in addition to many breweries no longer in existence, including Schlitz, Pabst, G. Heileman, and regionals like Lone Star, Pearl, Olympia and Hamm’s. Large and small importers, alike, including Heineken, Paulaner, Molson, and Warsteiner, also held annual conventions. The two to three day conventions were frequently held in the cities in which the brewery was headquartered, but they were also held in resort cities including New Orleans, Orlando, Phoenix, San Diego and Honolulu. The programs were usually led by not just senior management, but more frequently by well-known national speakers or motivators. Most suppliers had an extensive area in which to display new p-o-s items like wearables, and higher impact features like celebrities, brand funded events, race cars, balloons, boats and other interesting promotional materials. The purpose was to pump up the distributors to motivate them to achieve sales goals. There was certainly no deficit of things to see and do, but the highlight of every convention, no matter the supplier, was the new media and marketing. The lights went down in the convention center and the new commercials were shown. One could easily predict the success of the new ads simply by the response of the wholesalers’ at the convention. A polite response to a specific commercial usually indicated a disappointing ad. On the other hand, a standing ovation had the opposite effect. Either way, the response from the distributors was not a definitive prediction of an ad’s success or failure, but more times than not, the response at the convention was a good prognosticator of the ad’s future. With almost 112 million people viewing Super Bowl 50 a few weeks ago, just as distributors have done at their respective conventions, consumers will also show their approval or disapproval of the AB ads aired during the big game. Historically, AB has had top rated ads, however, the commercials AB ran this year did not win the top rankings. They even did make the top ten favorite commercials! AB ran no ads this year with either horses, dogs or frogs. Nothing cute or moving. But why? Why not go after another number one ad for the Super Bowl? The Michelob Ultra ad stuck to its core message which has not changed, and the growth of the brand continues to accelerate. Shock Top used humor to introduce their brand; while Bud Light used celebrities on an old theme and Budweiser really took a leap. AB continued the Budweiser Brewed the Hard Way theme with new creative ads. Macho, but, not the in-your-face type of theme. The ad was more about what the beer is not than what it should be. AB once again used crafts as its target, not to get to the craft drinkers, but to get to the non-craft drinkers. Perhaps the best AB commercial was the public service ad that had a very powerful message against drunk driving. Instead of a “pretty please don’t drink and drive” message, it was an in-your-face ad that really seemed powerful. An ad long needed. AB’s decision to not chase rankings, but to chase sales, seems to finally have caused them to understand something needed to change. Going forward, no one knows if this ad will have a positive effect on sales as AB and their distributors hope, but really what does AB have to lose? In this business you either sink or swim, or you don’t! Historically, each case of beer for sale in Texas was required to be 288 ounces. This applied only to beer which had an ABV of five percent or less. Any product over five percent ABV was either classified as a malt liquor or ale. Brewers offered 24/12 ounce packages in bottles or cans, but they only came in six-packs or loose. It was not until the middle of the 1970s that 12 packs became available. Schlitz, which was the dominate brand in Texas at the time, saw an opening in the 288 ounce per case regulation. Instead of 24/12 packages, Schlitz developed a 12/24 ounce can, called the Tall Boy. The Tall Boy became very popular, not only in the c-stores as a single serve, but it was the bootleggers’ package of choice for years because much of East Texas was still dry. Thus, the Schlitz Tall Boy became a can unique only to Schlitz. 2015 marked the 80th year of using cans to contain beer. It was in 1935 that Kruger Brewing Co. introduced the first beer, following soon thereafter by Pabst and Schlitz. Above you can see the evolution of the beer can in the US. 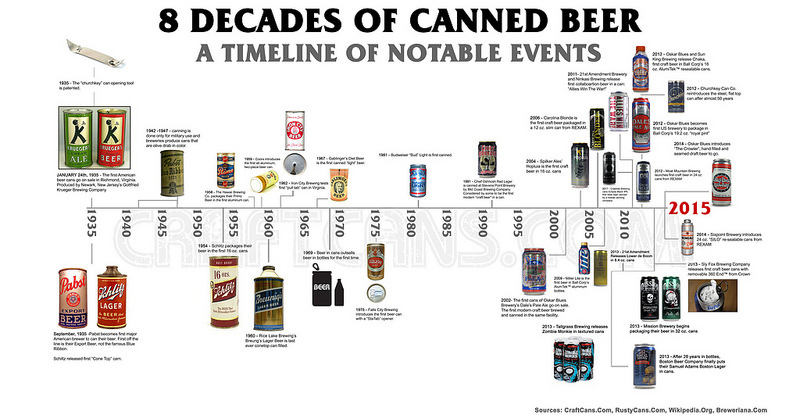 The chart shows the history, and in recent years, how the can has changed to impact all segments of beer. Even Boston Beers, which resisted offering Sam Adams in cans, relented and now has that packaging option available. In the last couple of years, domestics, led by Coors Light and Miller Lite, have promoted the reseal-able 16 ounce with success. So much success, in fact, that there have been shortages of this can thus requiring production postponement in some cases. Importers, including Warsteiner and others, have offered five liter cans for years. 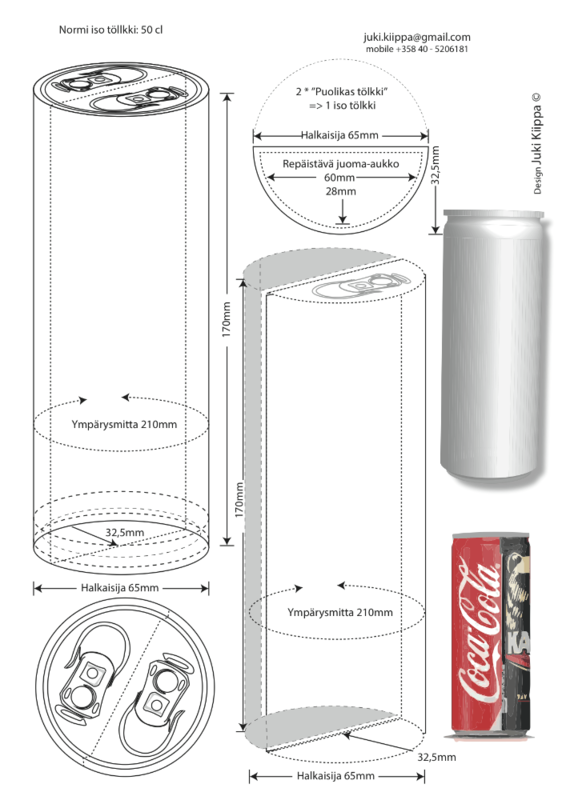 This is a great package for incremental volume, which can be called a mini-keg. Many small crafts have moved to the can instead of bottles. Much of this has to do with the mobile can lines which crafts can hire and use to get into the off premise channels. While doing this is expensive for the breweries, it is a simple but effective way to get the product to the off premise while adding new consumers. A good test to see if buying a packaging line makes sense. Cans have truly helped to grow the craft segment, cans have also helped to grow domestics. But what is next? The convince of cans had much to do with moving the beer business from the on premise to the off premise, thus resulting in increased beer sales. Can this package energize the growth of beer once again? Below is a picture of a new and very unique can design. Created by a bar manager in Finland, upon first glance, one cannot help but think, why was this model not thought of earlier? Take a 16 ounce can, split it in half to make an eight ounce half can. Instead of a round can, it is a semi-circle. Put the two semi-circles together and you have two eight ounce cans attached to make a 16 ounce can. The possibilities are seemingly endless. With two openings on top, a brewery can have two liquids in one package! Two types of IPA’s in one package! ABI could have eight ounces of Budweiser and eight ounces of Bud Light, all in one package. Graphics of each of the two different beers would be on their respective half of the can. Estimated additional costs of producing this type of can is about 20-30%+. A higher price point would be needed, but it is not prohibited. It might even be a better strategy to do this with a larger can, maybe a 24 ounce can or two 12 ounce sides. As a seasonal focus, a brewery using this can concept could put six to eight different flavors in one 12 pack. Hard to see any retailer or box store turning that down. An idea along these same lines might be just what the beer industry needs to jump start greater growth. Remember, the difficulty lies not so much in developing new ideas as in escaping from old ones. An editorial entitled, “The Craft Beer Cops,” in the January 22nd edition of The Wall Street Journal’s highlights “the burden of federal regulation on the good folk who want to create tasty beverages.” The quote was from Jeb Bush during a recent presidential campaign trip to New Hampshire. While there, Bush had the opportunity to meet with Erik Olsen of Kelsen Brewing Company. Olsen explained the licensing process to Mr. Bush and the myriad of requirements brewers had to complete in order to receive a permit from the TTB. Olsen explained that the process continues with each state, even detailing label approvals and expansion plans necessary for the TTB, further stating that companies must “file any expansion plans with the TTB, just like a new brewery that is opening its doors.” The agency “has to approve our plans before we can start using the new expansion space for brewing.” Olsen noted that the process could take as long as six months to receive approvals. Since prohibition, distributors have been very successful in getting legislation passed at both the state and federal levels that favor their tier. These include, but are not limited to, franchise protection, cash laws and dock sales. Distributors continue to lobby on all levels and even help in reducing federal taxes on beer. The Wall Street Journal’s article highlighted just how much the craft industry has gotten involved in the legislative process, similar to their predecessors, the distributors. In this case, the craft industry was focusing on the national issues that inhibit the industry with unnecessary legislative burdens. The impact of the craft segment is reaching past simply its products. Crafts have, and will continue to change and challenge the industry. The op-ed in the WSJ is a perfect example for such action. While some in the industry might push back on the craft’s desire to change parts of the beer world, in this case, the industry should support craft’s efforts to deregulate unnecessary regulations. It’s about time this happened. I’m not interested in preserving the status quo; I want to overthrow it.